Call it a parting gift. Call it a party favor. 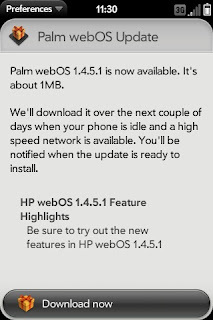 Heck, it might as well be a case of Turtle Wax or a year's supply of Rice-A-Roni, but HP is allegedly pushing out a very small maintenance update for devices running webOS 1.4.5. 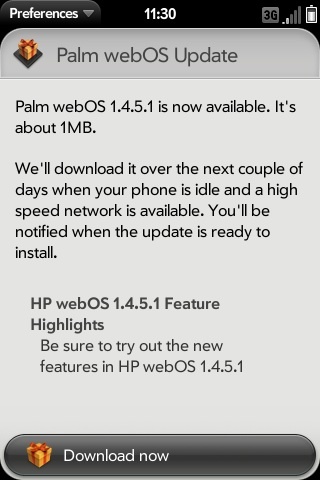 HP webOS 1.4.5.1 weighs in at an underwhelming 1MB and is reported to a bug fix release. I've been checking my Sprint Pre for the last two days and there has been no notice of a new patch in the Updates application. I've also checked the HP Palm support website, and the webOS Updates pages for the Pre, Pre Plus, Pixi, and Pixi Plus for Sprint, Verizon, AT&T and Bell don't list any updates. Someone keeping watch over the Twitter @webOSdev account claims the update is real and that they are "just cleaning up some bugs." Hopefully, one of the bugs that will get fixed in the update is the annoying HTML tag error in the Contacts notes field that was fixed in webOS 2.x, but not in the 1.4.x software line. I'll keep an eye out for the webOS 1.4.5.1 update and let you know if it finally arrives on my original Sprint Palm Pre. The Palm webOS 1.4.5 update was first rolled out for the Sprint Palm Pre on August 10, 2010. Additionally, HP has not yet released the details of their "alternative plans" are for customers who, according to them, will not be receiving the HP webOS 2.0 update.